Eagle Aviation's EA-100 was painted and airbrushed in a way sure to draw attention at AirVenture 2007. Owner Paul Klomhaus stands proudly alongside his project. Check EA-100 specs. What did you have to be thankful for last week when the nation paused for a day? Paul Klomhaus and his group at Eagle Aviation were nearly done with their Special Light-Sport Aircraft approval. No doubt they were thankful all the hard effort was drawing to a close. Yet Thanksgiving Day dessert came when the Wisconsin company earned their Airworthiness Certificate on Monday November 26th. The EA-100 is now #62 among aircraft that passed their Designated Airworthiness Representative (DAR) inspection. Eagle Aviation is located well with EAA's sphere of influence on Wittman Field, which now has its second producer of new aircraft Sport Pilots may fly (the other is homebuilt producer, Sonex). *** Klomhaus sources airframe components based on the work of Ibis Aircraft in Columbia. The south American company has built their very similar Magic series for 17 years. Oshkosh-based Eagle Aviation does final assembly, engine and avionics installation, and all the finish work. EA-100 has a fairly modest price tag of $88,995 ($20,000 less than Skycatcher) with the 100-hp Rotax 912S, day VFR instrumentation plus GPS, dual controls, and 20 gallons fuel capacity. EA-100 weighs 710 pounds empty, has a 42-inch wide cabin and cruises at 105 knots. What did you have to be thankful for last week when the nation paused for a day? Paul Klomhaus and his group at Eagle Aviation were nearly done with their Special Light-Sport Aircraft approval. No doubt they were thankful all the hard effort was drawing to a close. Yet Thanksgiving Day dessert came when the Wisconsin company earned their Airworthiness Certificate on Monday November 26th. The EA-100 is now #62 among aircraft that passed their Designated Airworthiness Representative (DAR) inspection. 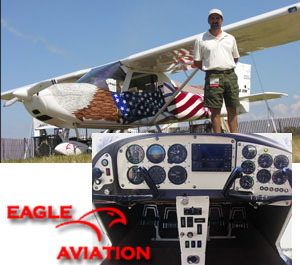 Eagle Aviation is located well with EAA’s sphere of influence on Wittman Field, which now has its second producer of new aircraft Sport Pilots may fly (the other is homebuilt producer, Sonex). *** Klomhaus sources airframe components based on the work of Ibis Aircraft in Columbia. The south American company has built their very similar Magic series for 17 years. Oshkosh-based Eagle Aviation does final assembly, engine and avionics installation, and all the finish work.